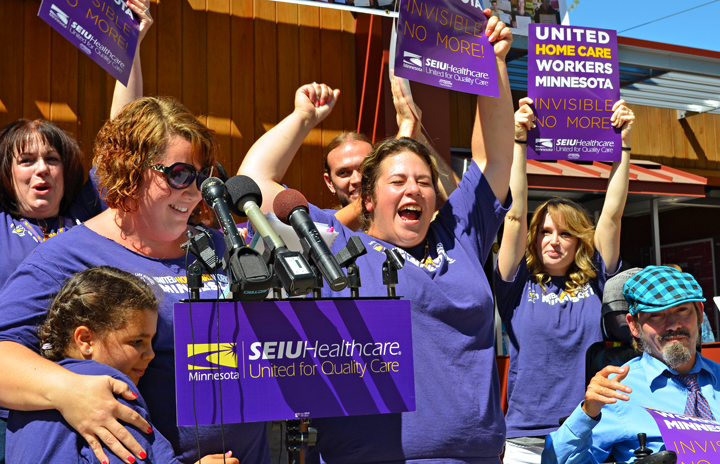 Pro-union home health care workers celebrated the results of their organizing election last August. The union contract that goes into effect today between the State of Minnesota and home care workers statewide is a big deal to Tallaya Byers. But it’s about more than paid time off, wage increases and other benefits that kick in today, the 38-year-old from St. Paul said. The historic first contract covers 27,000 workers like Byers who provide state-subsidized, in-home care for elderly and disabled Minnesotans. Ratified by members of SEIU Healthcare Minnesota and approved by state lawmakers last session, the contract increases the wage floor in the industry to $10.50 this year (and $11 next year), allows workers to accrue up to five paid-time-off days per year and provides access to training opportunities and grievance procedures. It’s a big step forward for home care workers, who organized a union to gain a stronger voice in an industry that took for granted a low-wage, high-turnover workforce. That’s an insult not only to home care workers, Byers said, but to the seniors and people with disabilities they serve. Negotiations between SEIU Healthcare Minnesota and the state began after workers voted decisively to form a union in August 2014. The two sides reached a tentative agreement in January, and over 95 percent of voting members ratified the agreement. Although membership in the bargaining unit is voluntary, the contract will cover all home care workers statewide. Byers said she expects more will sign up to become union members after the benefits of the new contract hit home.